iOrgsoft Data Recovery is a powerful program for users to recover files that are lost or deleted accidentally, formatting, and other operations. Various types of files are recoverable with this program. Recover deleted files on Windows XP/Vista/7/8. Undeleted kinds of files easily and safely. Undo emptied trash to recover deleted files from the Trash. Can recover Word, Excel, PPT, PDF, JPG, PNG, videos and audio files. Support to recover files from external storage devices like USB drive, SD cards, USB drive, digital cameras, iPhone, iPad, and other devices. DIY data recovery is not a dream now. Windows users do not need to be sad at the lost files or the mistakes they have made to delete the important files. 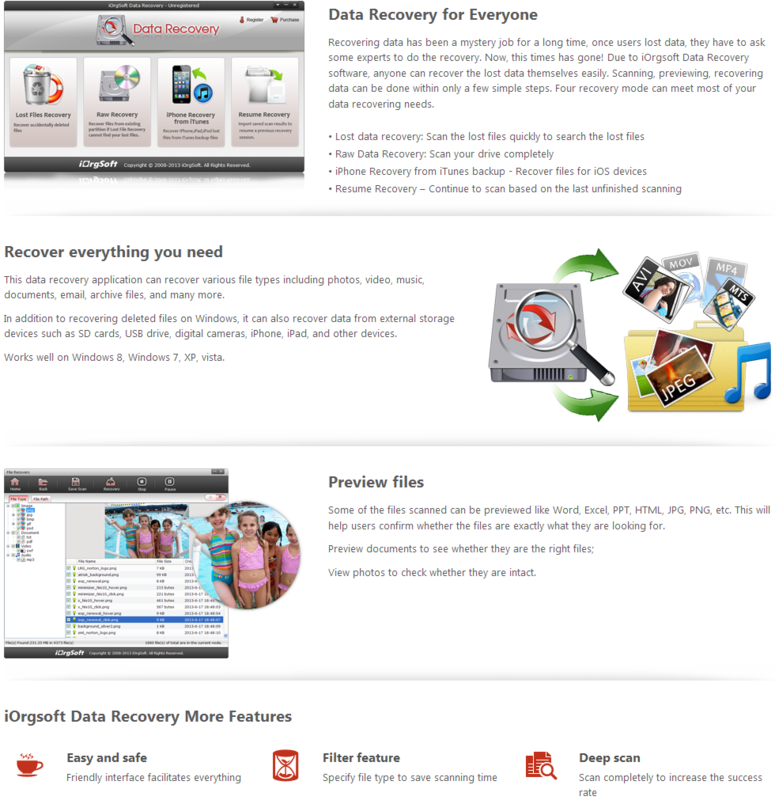 iOrgsoft Data Recovery, a great tool that can recover kinds of files due to whatever reasons like accidental deletion, formatting,and other improper operations on Windows. Besides, it can recover deleted files from external drives like USB flash drives, SD card, phones, tablets, digital cameras, etc. It is the safest for it only scans and reads the files and does not do anything else.